Our event 'Working together' on 26th September 2012 at the Molineux was an opportunity for social housing tenants and housing providers to come together to discuss some of the challenges that we face. 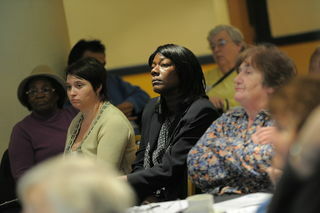 The event was well attended and the feedback is brilliant. We would like to thank everyone who attended for their input. We were pleased to have Cllr Bilson introduce the day, and officers from WCC, Accord HA, Bromford HA, Heantun HA, Nehemiah HA, Midland Heart HA, Wolverhampton Homes (WHs) and the CAB partipated by giving presentations and leading the workshops. We would also like to thank Sue Roberts MBE, the chair of WHs (who is also a Council tenant), for attending and for speaking. An officer from Sanctuary HA also came along and another HA, Woodlands Quaker, was represented by several of their tenants. We think this is the first time that social housing tenants and their providers from across the social housing tenure have come to gether for such an event in Wolverhampton. Many people remarked that they would like to see more events like this and more joint working. We face so many challenges ahead with the size of the waiting list for homes and the impact of the welfare reforms and the impact of the so called 'bedroom tax' that we really do need to work with one another to improve services and quality of life for tenants in Wolverhampton.